We have about a dozen horses on our farm that my husband has gathered over the years. Most of them have come here as colts that he bought. A few of them were born on our farm. The one thing they have in common is that my husband, with the help of a farrier a neighbour a few friends and some horse-training videos has trained them all. To my husband’s disappointment I’m not the horse lover he is. I once had a lovely horse named Blossom. She was part Arab, part something else (told you – not a horse lover). She was my horse and we got along fantastically. I trusted her to take me where I needed to go when we went on our mountain trips. Blossom and I bonded in many different ways. When she had a bad cut on her front lower leg (or cannon if you will though I’ve never heard a horseman or farrier or vet call it that) , I soaked it three times a day in epsom salts until it healed a few weeks later. When she got a horrific gash in her side I washed and rinsed and kept it clean until it healed two months later. I did more doctoring on that horse than riding, come to think of it. But, all the while I was doing it part of my mind was thinking “research”. That’s the upside of being a writer. Then the poor thing foundered and became unrideable. We couldn’t afford to keep her at the time so off to the auction mart she went. I tried to ride other horses since, but I couldn’t connect with any of them. I’ve ridden off and on since then, but have never ‘bonded’ with any of the horses my husband now has. However the one thing I still enjoy about horses is watching my husband work with them. I find the psychology behind horse training fascinating. We’ve watched various videos together on how to communicate with horses and how they read people. We’ve attended horse training clinics to watch professionals in action. Each has their own method and way of working but they all require one main quality. Patience and persistence. The one mistake I made when I first spent time with horses is thinking that they want to be your friend. That they are good and kind and gentle. Basically, Black Beauty in different colours. Then I saw the horses fighting. Ears back, hooves out, legs flying. Squeals and thumps that didn’t seem friendly at all. My husband explained that they were establishing their pecking order. That each horse has to find their place. That there is always a boss. That’s when my husband taught me one of the basic tenets of horse training. A horse will do anything for you as long as it knows that you are in charge. That you are above him. In previous times establishing this dominance often meant ‘breaking’ a horse. Pushing it and punishing it until it yielded. But this never made for a trusting horse. Nowadays getting a horse to yield means communicating using body language and making it easy for the horse to do what you want and hard for him to do what you don’t want. One of the first steps when my husband is training a horse is putting it in the round pen. Basically a pen with a high fence that is, well, round. He makes the horse go around and around until the horse is ready to ‘talk’. To communicate. He wants to connect with the horse. If the horse runs away when he approaches it, then he makes the horse go around and around the pen and then he tries again. Slowly the horse seems to ‘get it’ and eventually the horse is willing to connect. To do what my husband wants. Now there is a whole lot more to horse training than this simple step. 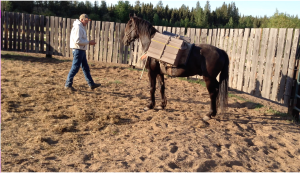 One of the things my husband does is start the horses off as pack horses before he puts saddles on them. So he has to get them used to that first. 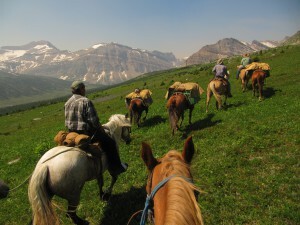 When they prove themselves trustworthy after a few mountain trips, he then graduates them to saddle horses. At the end of April my husband and I are going to an event where horse trainers will be working with horses in front of a live audience, talking about their technique and what they hope to achieve. Why they are doing what they are doing. Again, this will become part of my research. One of the books I have already completed had a horse trainer/farrier as the hero. I wanted to have a man who was patient enough to deal with my ‘break the rules’ heroine. And who knew how to deal with her. This hero and heroine are featured in Wrangling the Cowboy’s Heart though I still think the title should have been Wrangling Jodie’s heart. Finn is a by the book guy which is important because he is also a deputy. Jodie has always flown by the seat of her pants and gone with the flow. Now my hero doesn’t exactly put her in the round pen until she is ready to talk, but he has to use the same qualities of patience and persistence with her to find out what she is really all about. 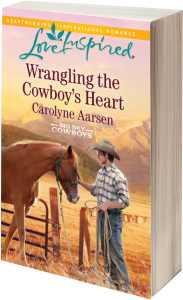 I hope you have a chance to read Wrangling the Cowboy’s Heart. Congratulations on your book! I look forward to reading it. By the way, I love the first photo…so sweet. Hey Jill, sorry I’ve been incommunicado. We had to pick up our grandchildren! Every time I see people working with horses I learn something new about psychology of animals. It’s very interesting. I loved horses when I was younger but never lived anywhere where it was feasible to own one. I enjoyed the blog post and your books. Hey, Linda, I think every girl loves horses at one time or another. I’m so glad you enjoy my books! That was so interesting, Carolyne. I am a horse lover, but I’m allergic to them, so I don’t get to spend a lot of time in the stables. I have ridden a few times since riding them only seems to affect my knees lol. Hey Kimberly, I hear you on the knees! I went up the mountains many years ago with my husband and I think I spent half the time leading the horse because I thought my knees were going to go out of joint! It’s better now, but I still don’t ride as much as my husband wants me to! So sorry you’re allergic. Thankfully no one in our family has had to deal with that. My husband used to love riding when he was young, but we’ve never had the money or the time to have horses on our farm. Horses need more than a nice pasture and cool drinking water. They need to be ridden regularly, and with his shift work, that hasn’t been possible. Now he is talking about getting a pony for the grandgirls! Hey, Valerie, thats one thing I learned from my husband, that horses constantly need attention and steady work.That’s why he loves taking them out into the mountains, he gets to work with them every day. I had no idea so much psychology went into training horses. And this is only a tiny part of it Merrilee! There’s body language and cues and etc and etc. Each different discipline has it’s own training program. Thankfully my husband hasn’t gotten into reining and cutting and barrel racing etc. He’s busy enough just keeping them in line! It’s actually very interesting. We both said we should have learned more about horse training before we had children . So very cool. I’m not a horse person – but I love to look at and read about them. Horses are very interesting animals, Elizabeth! I’m glad you love to read about them. I tend to put some in each book. My cousin is the one in our family who works with horses! I enjoy books that include animals!! I enjoyed reading your post! Thanks Linda! I like writing about horses. They are interesting animals. What an awesome post Carolyn. I think the first technique you mentioned, waiting for the horse to talk, etc..is join up developed by Monty Roberrts, right? Thanks Daria.Actually, yes! The first horse training videos were Monty Roberts. We’ve studied a few other trainers and watched a few others since. Carolyne, I really envy your family’s life with horses. We had horses when i grew up and I had a horse of my own, a filly named Sugarfoot. I called her Sugar. She really didn’t resemble her name at all. She was very stubborn and had the hardest mouth I have ever encountered. I didn’t know anything about training her, so I just loved her and rode her. She loved me back, but still knew she was the boss. My husband was also a horseman. He rode horses, broke them, rodeoed with them, etc. The difference between us was that he knew how to train them. We both still love horses, but are unable to ride them now, and daydream about the times when we could ride all we wanted. We really miss those days, but cherish what we have now. Thanks for writing about horses and trainers. I look forward to reading your book. It’s a pretty good life. I love country living and love having the horses hanging their heads over the fence when I come back from a walk. 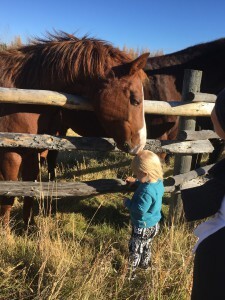 Our grandkids love feeding carrots the horses. I think it’s neat how you can have a relationship with a horse. Your husband sounds like he’s had an interesting time with horses as well. What type of rodeoing did he do? I do love the horse culture and one of the interesting things my husband and I do is go to the regular horse auction. It’s kind of addictive. Anyhow, sorry to hear that your horse riding days are over. That’s the sad part of growing older. Wow! Very interesting! I love the “idea” of horses and I think they’re beautiful creatures, but I’ve only been on one twice. I love to read about them though!